The reigning champ of most Earth-sized planets yet is a world called Gliese 581 e, which circles a star that has four planets total. It is called the smallest because of its mass, which is just 1.9 times the mass of Earth, making it the lightest known alien planet to date. The other planets range in mass from 5 to 16 times the mass of Earth. 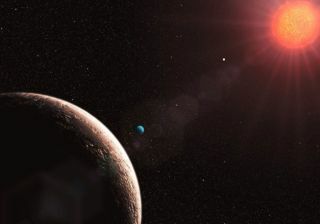 Theannouncement today of a newfound group of alien planets orbiting a distant starhas added another candidate for the growing list of potential Earth-sizedworlds beyond our own solar system. Astronomersstill have to confirm the presence of the possible Earth-sized world. But theysuspect it has a radius just 1.5 times that of Earth, which would make it the smallest alien planetyet found,if confirmed. Mass:Unconfirmed, but radius estimated at 1.5 times that of Earth. Researchersstill need to confirm that this planet exists, yet they do have a general ideaof its characteristics. Thispostulated planet circles the sun-like star Kepler-9 with two much larger, Saturn-sizedplanets, and it orbits closer to its star than its big companions do. All threeplanets could fit inside the orbit of Mercury if they were inside our own solarsystem. Observationsfrom NASA's planet-hunting spacecraft suggest this planet takes only 1.6 Earthdays to revolve around the star. This isanother potential planet that remains to be confirmed, but astronomers usingthe European Southern Observatory (ESO) in Chile found hints of its existencearound the sun-like star HD 10180, which may have up to seven planets in all. FiveNeptune-sized planets have been confirmed, with the Earth-sized world ? whichESO calls HD 10180b ? and another planet still pending. If all are confirmed,it would be the most planet-populated alien solar system yet found. Thisplanet, if it exists, could be among the least massive ? and thus closest toEarth-sized ? ever found outside our solar system. But the similarities withour home planet end there. Astronomersthink HD 10180b orbits extremely close to its parent star, just 2 million miles(3.2 million km) or so. Compare that to Earth, which stays about 93 millionmiles (150 million km) from the sun. Observationssuggest the planet completes its orbit in only 1.18 Earth days. Thealien world Gliese 581e definitely exists.It orbits the red dwarf star Gliese 581 along with at least three otherplanets. Gliese581e is nearly twice the mass of Earth, and it's likely a rocky planet. Butlife probably has no hope of taking root there. The planet is so close to itsstar ? it completes an orbit every 3.15 days ? that its surface is almostcertainly far too hot. Gliese581e's companion planet, Gliese 581d, is quite a bitbigger than Earth. But Gliese 581d intrigues astronomers, who think it mightjust be in the habitable zone of its star ? somewhere in that just-right rangeof distances that allow liquid water to exist on a planet's surface. Anotherplanet in the system, Gliese581c, was also a contender for liquid water, but astronomers later foundthat it was likely too hot. Anotherpoint in the Gliese 581 planet system's favor: its star appears to be old andstable. Basedon the stability of its light, astronomers think Gliese 581 has been around fora few billion years, and that it likely hasn't belched out huge,planet-scorching bursts of radiation too often. CoRoT-7B (named after theFrench telescope that discovered it) shares some important characteristics withEarth. It is, for example, the first confirmed rocky world outside our solarsystem. But it would not be a particularly pleasant place to live. CoRot-7B orbits just 1.6 million miles (2.5 million km) from its parent star, andthe planet is likely tidally locked: the same side is always facing the star,just as the moon only presents one face to Earth. So oneside of CoRot-7b is probably a hellishly hot 4,000 degrees Fahrenheit (2,200degrees Celsius) while the other, in perpetual shadow, dips down to about minus350 F (minus 210 C).